Winchester is a city steeped in history, ancient traditions, lore and legend. These things are everywhere you look. The streets you walk through, the architecture that lines those streets. But it is always the people that make a place. The people are its life blood. The people are what brings this city alive and the pinnacle of that life force is celebration. We brings alive that greatest of English celebratory traditions, the banquet! I guess its there in the name. Taste the Cracklin Hog Roast! It immediately conjures up images of great feasts in banqueting halls. Marvellous arrays of wondrous foods served up on platters to throngs of hungry, happy people swigging, singing, feasting . . . . sorry, I got a bit carried away there . . But that is what we do at the Taste the Cracklin. Your celebration could be for 30 or for 3000. A beautiful banquet is what we will bring you. All of it. We can set up in a corner of your garden for a cosy do. Or we can build a catering department at your humongous social event of the year! The great service and wonderful food that we are known for will be just as efficiently and confidently provided, no matter what, where or for how many. Obviously when you have a hog roast there is a hog. That goes without saying. 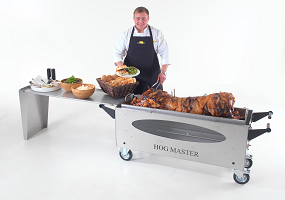 The hog, or hogs, roast on a great spit on one our, very impressive, all new fang-led, hog roasting machines. It is truly the centre piece of our food operation. However, the thing that we pride ourselves on most is our preparation. Our ethos is Fresh! Fresh! Fresh! All our ingredients are fresh and we prepare and cook everything, absolutely EVERYTHING right there, live and fresh at any and all our hog roasts in Winchester. Every kind of meat, again, not just pork. Beautiful, fresh salads and vegetables. Vegetarians are catered for just as enthusiastically. Deserts to die for. A wonderful, colourful, aromatic, expertly presented banquet for you to feast your eyes, nose and taste buds on. When you book us to cater your event, we will come along early to set up. Like I say we need time to prepare our produce and it must be right. We are very practised at this, likewise when we are finished our part of your day, we pack away. We will always clear up without any fuss or intrusion. It will be like we weren’t there at all. Well apart from all the very sated, happy tummies. Catering is great fun. It is a job that is very rewarding. Everyday for us is a party. Your party! We put a lot of hard work in to making it as much fun as we can. By working hard and being efficient, approachable and helpful, to a fault, we enjoy ourselves just as much as the guests, well almost.